You’ve come to the right place to learn job hunting methods from a top job search expert. 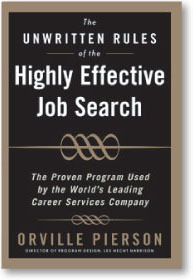 Orville Pierson’s career books and his unique job hunting system, The Pierson Method, have been used by over a million people worldwide. He has always taught job search networking, and has now made his entire networking system available in Highly Effective Networking: Meet the Right People and Get a Great Job. On this site, you can learn more about Orville, his books, and how to Find a Job. 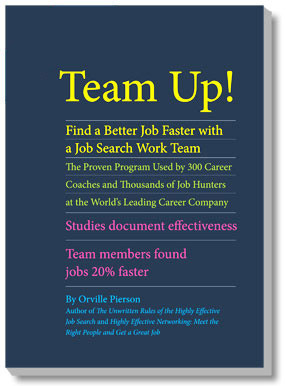 You can also learn more about Job Search Work Teams, the proven program used by 300 career coaches and thousands of job hunters to find better jobs faster. And if you’ve already read his books, you can click here for free downloadable resources for Job Search Work Teams. Tired of lonely solo job hunting? There’s a better way. Complete your job search faster as part of a team. Collaboration and teamwork often make work go faster and better, and that’s certainly true in job hunting. Joining a team can make your job search more comfortable as well as more effective. This book shows you the evidence on why these teams work so well and exactly how to join, lead or start one. The Unwritten Rules of Highly Effective Job Search tells you how to plan and organize the entire job search in the most effective ways possible. It includes information on making a Project Plan, creating a Core Message, and using Progress Measurements so you can tell how fast you’re moving toward a great new job. 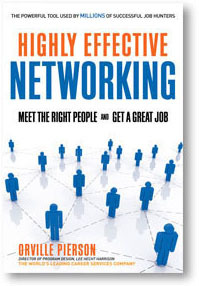 Highly Effective Networking focuses on networking, the one job hunting technique that virtually all experts agree is essential to job hunting success. It includes information on mapping your networks, selecting the right contacts, making new contacts with Decision Makers and the best ways to handle common networking situations. I wrote these books to fill what looked to me like gaps in existing job hunting books…All of these books focus on the methods that have proven most effective over the years with over a million job hunters. Job Hunters often think that writing a resume is the first step in job hunting. But you’ll actually write a better resume if you take a systematic approach to your search and create a Project Plan before you start writing. Want to get better at networking for a job? Many job hunters are concerned that they don’t know the right people or that their network is too small. But it’s always possible to start with people you know and get introductions to the people you want to meet – if you know how to plan your networking and know what to say. Highly Effective Networking in a job search is different from other networking, but anyone can learn how to do it. Click here for free downloadable resources for Job Search Work Teams.